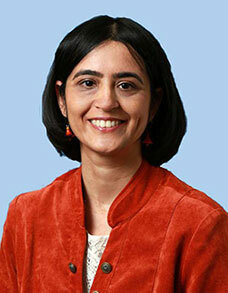 UCI neuroscientist Medha Pathak, PhD, an assistant professor of Physiology & Biophysics at the UCI School of Medicine, was awarded a prestigious National Institutes of Health award to study the mechanics of human neural development. Irvine, CA – Oct. 2, 2018 – University of California, Irvine neuroscientist Medha Pathak, PhD, an assistant professor of Physiology & Biophysics at the UCI School of Medicine, was awarded a prestigious National Institutes of Health Director’s New Innovator Award from the NIH Common Fund’s High-Risk, High-Reward Research program. Designed to support unconventional approaches to major challenges in biomedical and behavioral research, the New Innovator Award is given to exceptionally creative scientists who propose high-risk, high-impact research. “In this project we focus on how, as the brain develops, proliferating cells organize into structures, differentiate, migrate and connect with other cells. I’m interested in how these biological processes produce mechanical forces that, in turn, shape cellular dynamics and organ patterning,” said Pathak. A major unanswered question in developmental biology is how the mechanical forces produced during development are detected and transduced by cells to shape the biochemical and genetic programs of development. Pathak’s work will measure and manipulate mechanical forces at different points during the initial steps of human brain development. Using human brain organoids, her research is designed to provide quantitative and mechanistic insights on the role of mechanical forces during development and demonstrate how development fails when these forces are disrupted. "We are very proud of Dr. Pathak’s approach to science," said Michael D. Cahalan, PhD, distinguished professor and chair of UCI’s Department of Physiology & Biophysics. "Our department seeks to foster a research environment using cutting-edge techniques to address bold questions in biomedical research, exactly as she has succeeded in doing. Kudos to Dr. Pathak for this award, which will help to launch a long and productive career,"
Pathak’s New Innovator Award, is one of 58 given this year. Established in 2007, this category of award supports unusually innovative research from early career investigators who are within 10 years of their final degree or clinical residency and who have not yet received a research project grant or equivalent NIH grant. The NIH issued 10 Pioneer awards, 58 New Innovator awards, 10 Transformative Research awards and 11 Early Independence awards for 2018. Funding for the awards comes from the NIH Common Fund and other Office of the Director appropriations; National Cancer Institute; National Center for Complementary and Integrative Health; National Institute of Allergy and Infectious Diseases; National Institute of Diabetes and Digestive and Kidney Diseases; National Institute of General Medical Sciences; National Institute of Mental Health; and Office of Research Infrastructure Programs. Each year, the UCI School of Medicine educates more than 400 medical students, as well as 200 doctoral and master's students. More than 600 residents and fellows are trained at UC Irvine Medical Center and affiliated institutions. The UCI School of Medicine offers an MD degree, a dual MD/PhD medical scientist training program, PhDs and master’s degrees in anatomy and neurobiology, biomedical sciences, genetic counseling, epidemiology, environmental health sciences, pathology, pharmacology, physiology and biophysics, and translational sciences. Medical students also may pursue an MD/MBA program, a combined MD/Master's in Public Health or a dual MD/master’s program called the Program in Medical Education for the Latino Community (PRIME-LC). UCI School of Medicine is accredited by Liaison Committee on Medical Accreditation (LCME), and ranks among the top 50 nationwide for research. For more information, visit som.uci.edu.